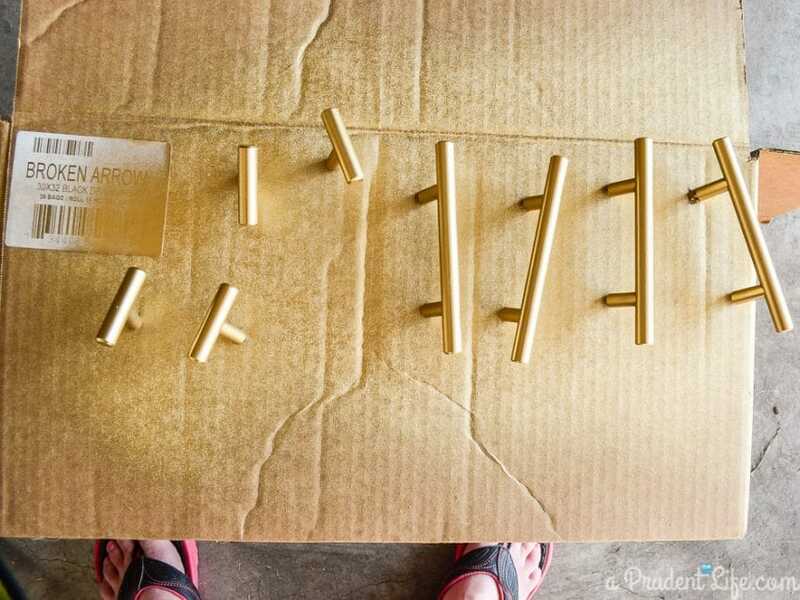 As part of my ongoing One Room Challenge makeover in my pantry, I needed some gold cabinet and drawer pulls. Most of my budget for the room went toward my penny tile wall, so paying a ton for cabinet hardware wasn’t going to fly. Instead of settling on something that wasn’t my vision, I did a little DIY magic to get the look I wanted for less! I loved the Kohler Purist Pull (found on Wayfair), but didn’t like the price of $23.33 per pull. 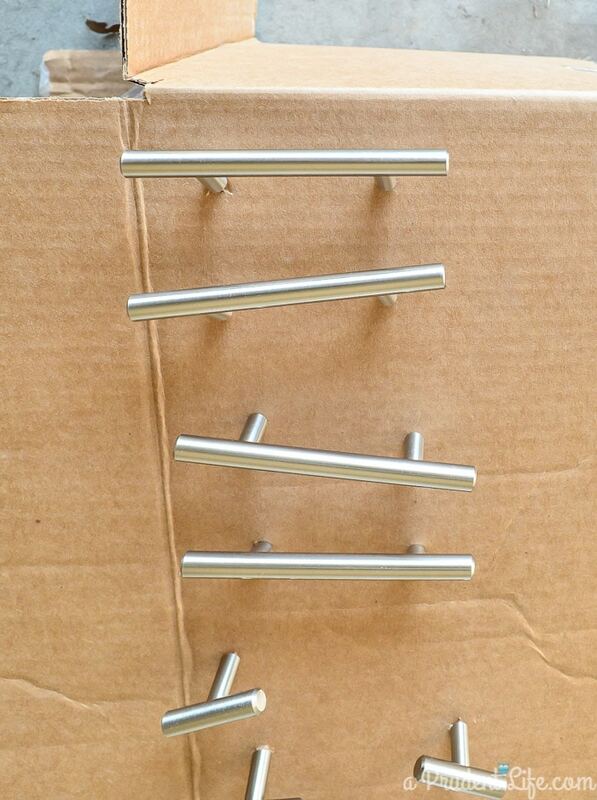 Plus, I wanted to do T-Bar pulls on the doors, similar the ones I used in my laundry room. I found some in gold, but they were from a different manufacturer so the colors were way off. 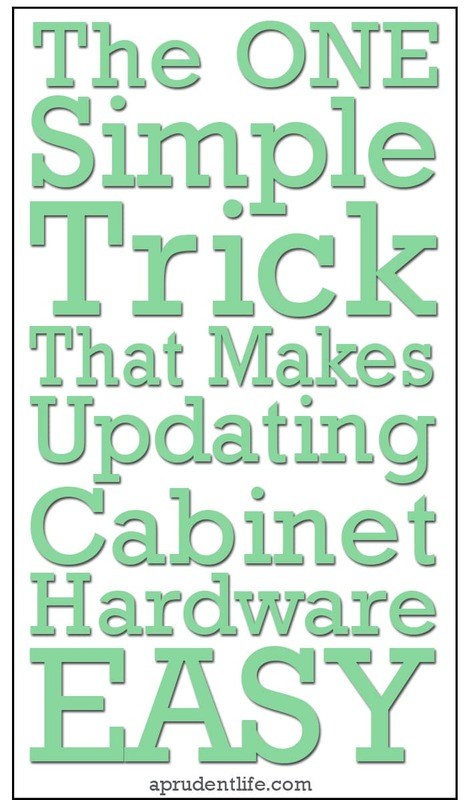 Going with the faulty assumption that the colors would have matched, it would have been $116.65 for 5 of the 5″ drawer pulls + $32.80 for 5 of the small cabinet pulls for a total of $149.45. I knew I could beat those prices! I found pulls in the right shapes on Amazon, where you can buy them in all different quantities. We are going to be installing the same pulls on our kitchen cabinets, so I went with 25 packs of each style. My total for FIFTY pulls was only $99.70. SO much better than $150 for TEN. All Pricing was accurate in 2014 and used as an example, not a guarantee of current pricing. My total cost for the pantry portion of the hardware was $19.95 plus a $4 can of spray paint. So $23.95. Instead of $149.45. That’s a savings of 84%!!! For a comprehensive of list of all the sizes and quantity discounts available, check out my updated 2016 cheap cabinet hardware post. AND not only did I save money, I was able to get the exact shade of gold I wanted. It only took 10-15 minutes for the transformation. I started by unpacking all my silver hardware. Then, I came up with a great technique that made the painting process easy. 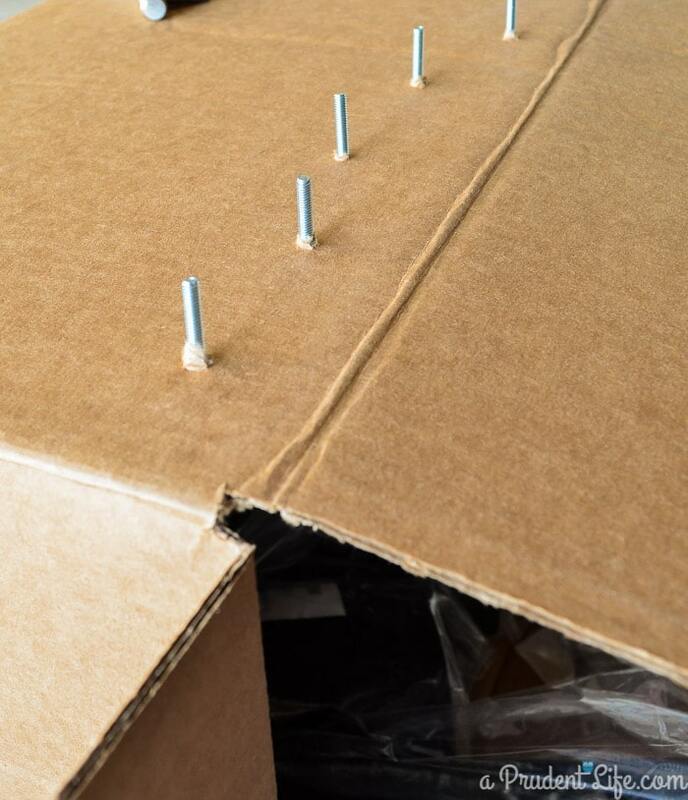 I grabbed a cardboard box and pushed the mounting screws through the top of the box. That way I could attach all my hardware to the box so it wouldn’t fall over and mess up the paint! I left the screws loose enough that each piece of hardware could be flopped from side to side, which helped the painting process. Other than the cardboard box trick, using a quality spray paint made all the difference. My go to gold is Rust-Oleum American Accents in Metallic Bright Gold. For some reason, I have trouble finding it at the hardware stores, but our WalMart carries it. After a bunch of shaking, I started applying light coats of paint to my hardware. I didn’t have any trouble with dripping or running. After a couple light passes, my hardware looked amazing. They really look like it was the factory finish. What is up with the weather? I should not be wearing flip flops in the garage at the end of October! I left my hardware in the unseasonably warm garage for a few hours until it was dry. It actually felt dry after several minutes, but I didn’t want to take any chances. Once the dry time had passed, I was in LOVE. I’m going to be a tease and not show the pulls installed on the cabinets until the One Room Challenge reveal in two weeks. Make sure you are on my new post email list so you don’t miss out! You can sign up at the top of this page. UPDATE: To see all three rooms I’ve now used this hardware in, along with a comprehensive shopping guide to this hardware, visit the Cheap Cabinet Hardware post here! Have you seen the rest of my One Room Challenge posts? Don’t forget to pin it so you don’t forget it! That’s my favorite gold spray paint too! And yes, why does only Walmart carry it? The handles look amazing! I was telling my friend to spray paint her kitchen knows but she’s worried they won’t hold up. Can’t wait to see your room in 2 weeks! Ha! So funny I am reading this while I’m in-between coats of gold spray paint on the exact same pulls! Too funny! 🙂 Yours look great as does your entire pantry. I’m majorly jealous of the pantry room as opposed to my pantry cabinet. a deal and a steal and a great makeover!! Thank you! thank you! Thank you! I have 24 pulls on my kitchen cabinets. I didn’t want to replace them all, but haaaaated the old school black metal. I will now paint them gold. Will look great with my white cabinets! God bless you! Love the style of the pulls, but I’m wondering… do you catch your pants pocket or hoodie pocket on the part that hangs out when you walk by the drawers? That’s a great question! It hasn’t happened yet, but the location of them in the pantry doesn’t make that as likely to happen as it would if they were in the kitchen. I catch myself on our level style door handles all around the house, so I really hope the same things doesn’t happen when I install the same pulls in the kitchen! Just wanted to check in and see how the paint on these pulls is holding up for you. 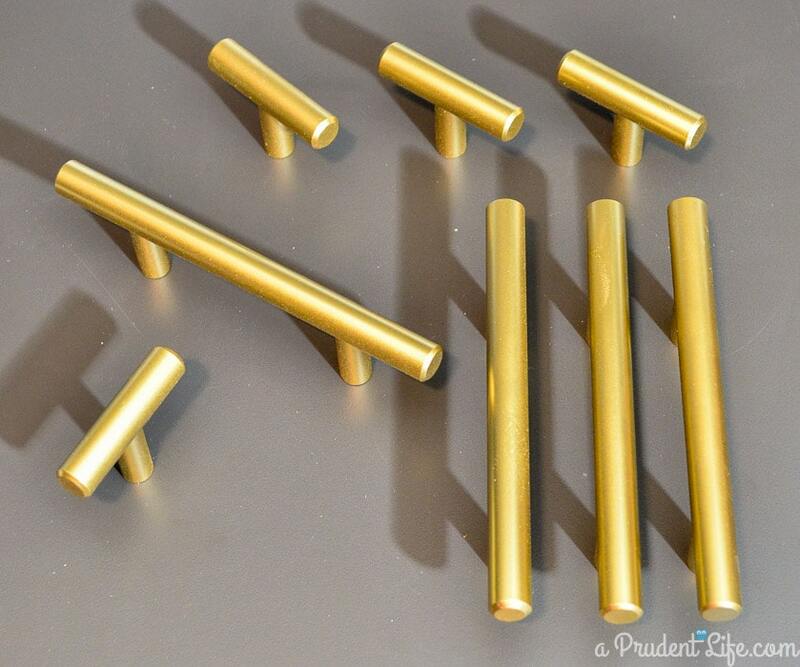 I have a bazillion pulls in my apartment that I want to spray paint, but I’m worried that for high-use applications, like kitchen cupboard pulls, the spray paint will wear off. They are holding up amazingly well – I have a six month follow up picture of them on this page about halfway down: http://www.polishedhabitat.com/2015/the-state-of-the-pantry-six-months-later/ I think I mention it in that post, but in case I didn’t, I don’t use them every single day, so even the six month update isn’t exactly the same as if they were in the kitchen. BUT, they are flawless enough in the pantry, that I wouldn’t hesitate to do that same pull/paint combo in our actual kitchen. I would guess that different pulls would take the paint a differently and if you had a super high gloss pull, it might be more problematic. Also, if they are existing pulls, make sure you use some kind of degreasing cleaner on them to get the years of oil from fingers off of them before painting. I think I did have an advantage starting with brand new items (even though it was scary to alter something right out of the box). Hope that helps! Super-helpful! Thanks for the quick reply! I’m definitely saving money this way. I placed an order already and when I saw this post (making my rounds for the fall ORC) I was thrilled. YAY! thank you, I can visually see how they turned out. I will give you a shout out once posted. 🙂 I like to share and give credit wherever I see it first. Oh I’m so glad this was helpful to you! I’m planning to use the same pulls in the master closet on the dressers. You just can’t get that much chicness for a better price with anything else! Can’t wait to see your results! Hello! 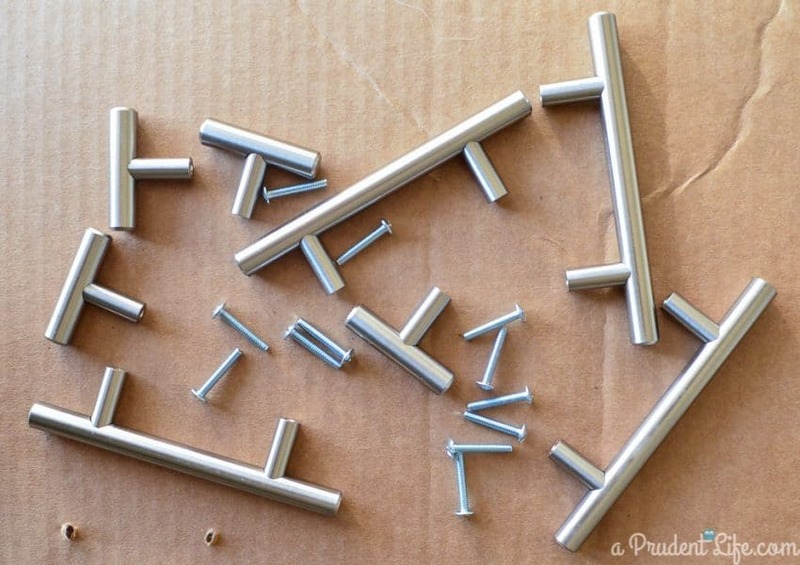 Great post, as I’m going to be doing the same to my cabinet pulls. The problem I’m having is that my cabinets are drilled to 5″ centers (which unfortunately seems to be a european measurement). Are you finding that the spray paint is rubbing off at all as you are using the pulls? I’m just deciding on a clear coat over or not? thanks so much! The only time I’ve had it wear at all has been when I kept carrying around a pile I just did for our master closet, letting the metal handles bang on each other (smart, right?). From normal use, we haven’t had any issues. My only hesitation using a clear coat would be that IF they eventually get worn, I’d worry about painting another coat of gold over the clear coat. As is, I like that I can unscrew them and put on another coat of paint if I ever need to. I found your post via Pinterest because I’m about to spray new hardware for this exact reason (champagne taste with a beer budget!). The difference is that my hardware will be for the kitchen and I have a busy family of four. I’ve already tested the process on one knob (I bought one extra – that’s how cheap they were! ), but I’m so scared to pull the trigger for all the hardware in case it doesn’t hold up. This might be a stretch – but do you have knobs on the kid’s bathroom drawers? Maybe you could swap out your tester in there and see how it goes for awhile? I figured worse case scenario I’d just have to unscrew them and repaint them occasionally, but that hasn’t been needed yet. This post is just what I was looking for. I think I want to make my hardware gold in my bathroom, as well as my towel holder, toilet paper holder, and light fixture. Do you think this paint would be good for those projects? Absolutely! If it is your existing hardware, just make sure you clean it with something like a degreasing cleaner to get all the built up oil (from our hands) off of them first. Hi Melissa! 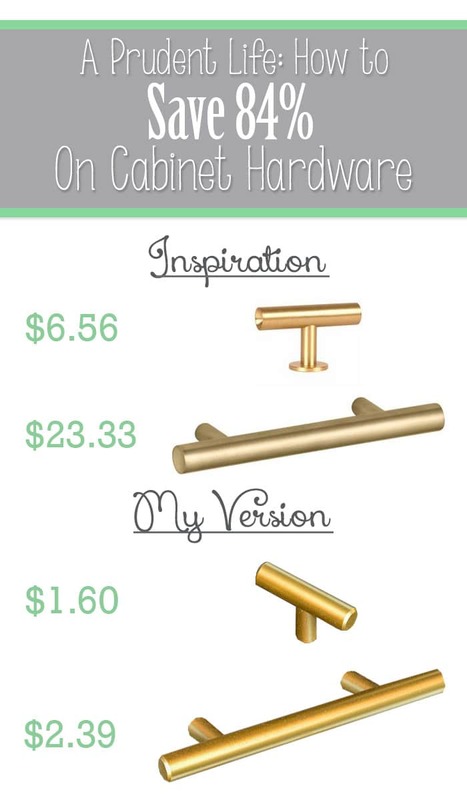 I came across your blog through Pinterest, when I was looking for DIY tutorials on kitchen hardware – because, let’s be honest, who has $25 to spend on EACH CABINET PULL, am I right? The husband and I are in our 11th month remodeling an abandoned 1930 bungalow, and I’m at the part where I need to figure out the kitchen situation…. I love, love, love what you’ve done here; would you mind sharing your source for the budget-friendly pulls your scored on Amazon? I can’t seem to find it in the article. Thank you!!! Oh My Gosh. I’ve always thought I linked to the hardware in that post! Here’s a link to the 5″ size (3″ between holes): http://amzn.to/28ULN3M and here is the smaller T style: http://amzn.to/28TjC4W (both affiliate links). Thank you SO MUCH for asking. I’ll update the post now too. Thanks so much, Liz! Great idea with the egg crates! How did you you paint your fridge handle gold and with what? I LOVE it! Hi LeeAnne, The handle unscrews from the fridge, so I just took it into the garage and painted it with the same spray paint from this post. I think it’s been 2 1/2 year now, and the hardware still looks great, but the fridge handle is finally starting to chip. I’m planning to give it a fresh coat of paint this spring. Think this would work on the hinges as well? I’d be more hesitant to try that if I wasn’t prepared to replace them if it didn’t work. I’d worry about the motion working the paint over time. That said, if you are ready to replace them, it couldn’t hurt to try it before buying new ones!